A friend of mine recently bought this early post-war Alvis in Denmark. 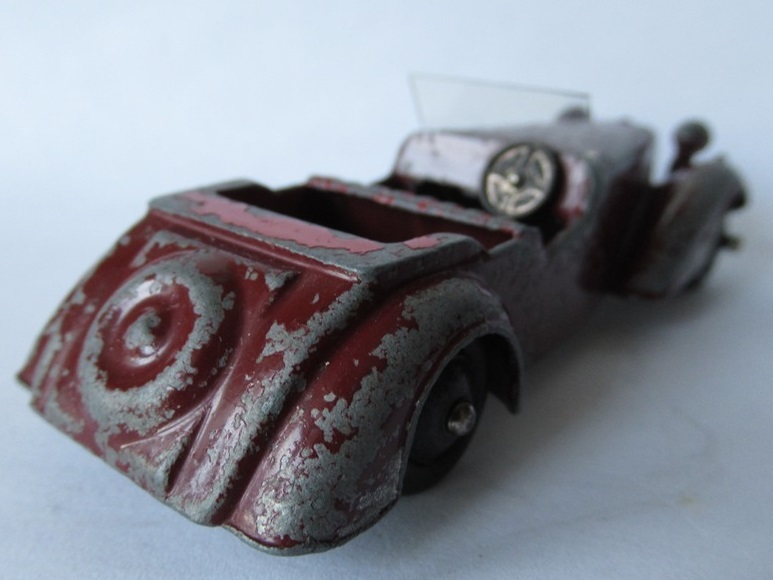 It is a very early post-war issue, with pre-war-style lacquered base, smooth wheels and solid steerig wheel. I should think this is quite a scarce issue - how long did production continue with the lacquered base plate? He bought it from the original owner, and it has always lived in the box shown in the picture. It is clearly not an Alvis trade box, but could it be Dinky in origin? There is no printting apart from that code printed on the base, but one flap is missing. 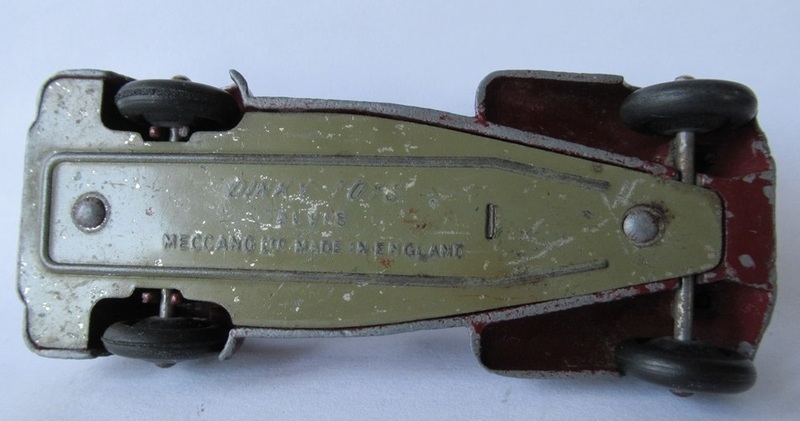 Any further information on the car or box gratefully received! 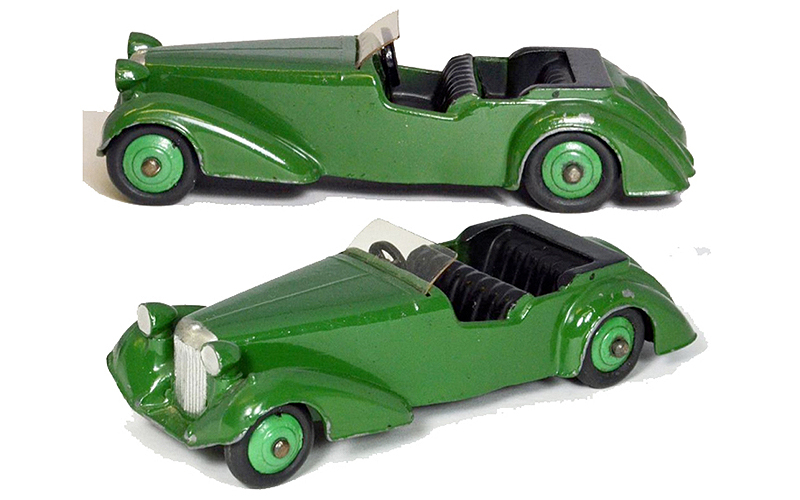 The early version with the lacquered base is the one on the right with red seats. Lovely model, very early Post War I would have thought, I've got a 38b with smooth hubs, white tyres, laquered base the lot, the only things proving it isn't Pre War are the thicker axles and the fact it hasn't dropped to bits. This is a 38d not a 39d, can you edit your title on this please. Oops, careless typing there! Corrected now. Does anyone have any ideas regarding the box? I'm pretty sure the box is home made, it doesn't look like anything Meccano would have made. They used to either use a letter followed by 4 digits or a 5 digit code sequence. This in no way detracts from a lovely model. ps : there is an another topic on the Alvis. Perhaps can we join both ? For you, Richard, as a variants collector, there are still some more to go I presume. The ones you own, however, are quite nice already! Here is the Alvis Tourer. Thank you for your coments. And now, they are three ! Here under, my Alvis n°4 ! In fact, it's the n°1 because it is the oldest ! As I wrote in the new arrivals topic, it has a solid steering wheel, smooth hubs and the same coloured base plate as the Fred model he showed above.